Wow, congratulations on your profit yesterday, am really happy for you, and the fact that you quickly exit that trade really is impressive, because the price immediately make bullish movement yesterday. Yes I agree with you on usdx as today is the last day of the week, there will be a little retracement, so we need to be careful buying usd. The following 13 users say Thank You to hayzee19 for this useful post. Friday again, investors should take profits on USD, so a correction in AUD or, EUR should weaken the dollar and risk aversion has hit the markets again, but it is dificult to say for sure, hesitation still exist. I wait for the new week where more downside for AUD should prevail even with a weakest dollar. The following 6 users say Thank You to FlyingShark for this useful post. congrats mate that is a big amount of withdrawal. I also made 182$ profit withdrawal before getting margin call this week. I was careful amount my trading still i got MC. I think your withdrawal request will be processed soon because i saw that instaforex is processing withdrawal quickly now a days.Yes i think it's better not to open any position when your withdrawals is pending otherwise they will refund that balance into your account .It's true that this week was giving a trouble for many of us because of unpredictable movement of GBPUSD, yesterday was a disaster for many of us because we are thinking that pressure of sell will continue but after dropped at 1.2853 it suddenly moved more than 140 pips and reached at 1.2995 which was a big swing and totally unexpected for us. But today i think GBPUSD will show some bullish move and the possibility of reaching at 1.2990 is higher. The following 7 users say Thank You to FxBD for this useful post. Congrrat Baby for withdrawing, i dont know if it is a must obey rule here that when you place withdraw that you have to wait till it is processed. However today seem to be dull not because it is friday but because the way market look like.. There are fridays that have busy market contrally to what traders believe that fridays are always dull. The following 7 users say Thank You to paulokepaul for this useful post. The following 5 users say Thank You to arda for this useful post. Your all payments is pending no problem wait for some more time and you received your payment soon and than again start your trading and earn more profit so lean more good market movement and learn well. The following 7 users say Thank You to Karbi for this useful post. first of all I'm new here so actually I don't know about bonus but after reading your post I think bonus is credited on every Friday am right? because I didn't with real account so I never faced any margin call but I did to much loss on demo account due to practice I'm still learning about forex business and I see your screen shot about pending withdraw well it's really good congratulations and please tell me when your withdraw gonna proceed. The following 4 users say Thank You to Muftaa for this useful post. A new week and a new battle to stay in the market and make profits Are you ready? The following 28 users say Thank You to fadilah for this useful post. At first wishing you greetings and good morning for this nice morning, also many many congratulation for your profit and for your withdrawal. The amount is over 100$ in a week, its such a decent amount i cant believe anymore. I wish i got that profit in a month. We are much thankful to mt5 and instaforex, thank you very much instaforex and long live mt5 forum. GBP and NZD moved too much last week, did you see the gap of usdchf? Buyer with this pair got too much profit by default. And you remembering us that this week we have lots of news about GBP and USD. Specially we should look forward with USD, if you look it then everyone can trade with all major pairs. Good luck for this monday mate. See you very soon. The following 13 users say Thank You to Jeinap for this useful post. 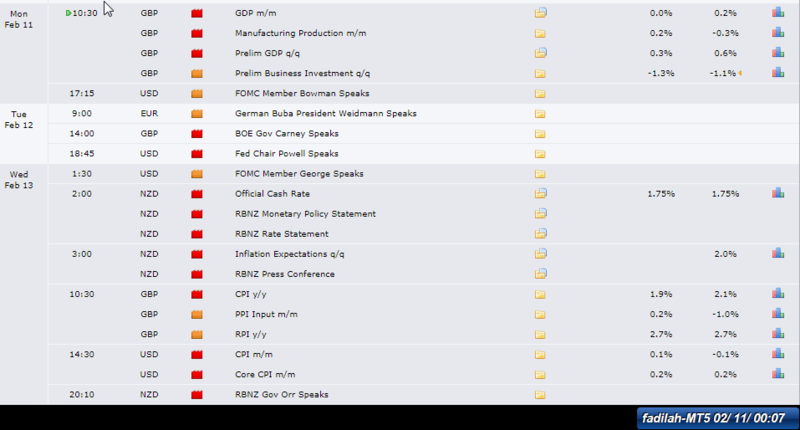 Today GBP has high impact data release and on Wednesday NZD also has high impact data releases relating to interest rate. This can be an opportunity to get more profit and withdrawal with good amount. I might not be able to follow GBP because there is still floating loss on AUD/USD but for NZD i will most likely follow because price movements will move significantly. Good luck for you and remain careful. The following 9 users say Thank You to dedy hari kurniawan for this useful post.